Please interact with this resource for a few minutes. Explore! After doing so, answer the question that appears below. To explore in GeoGebra Augmented Reality, see the directions below the first screencast (below). How would you describe the relationship among the cone's radius, true height, and slant height? Be specific! 1) Open up GeoGebra 3D app on your device. 4) Go to the MENU (horizontal bars) in the upper left corner. Select OPEN. In the Search GeoGebra Resources input box, type j9yyv3md (Note this is the resource ID = last 8 digits of the URL for this resource.) You could also try typing Cone Anatomy. 5) In the resource that uploads, zoom in/out if needed. 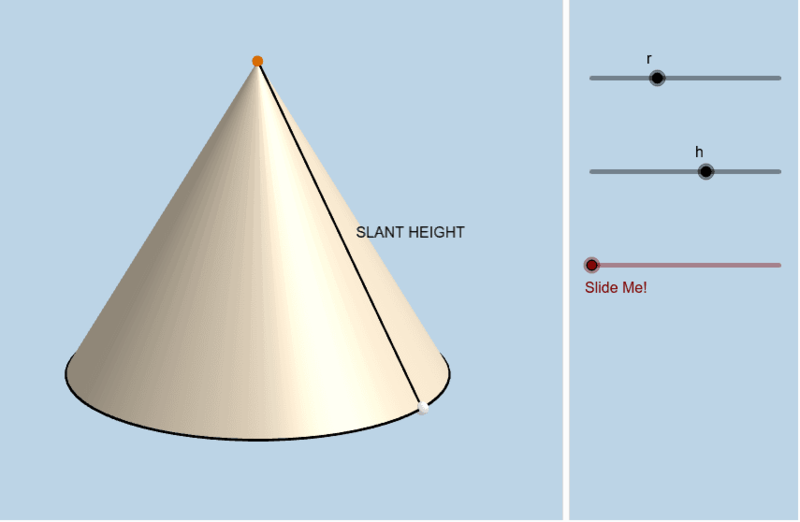 ﻿Use the r slider to control the radius of the cone Use the h slider to control the height of the cone. Use the Filling slider to animate.